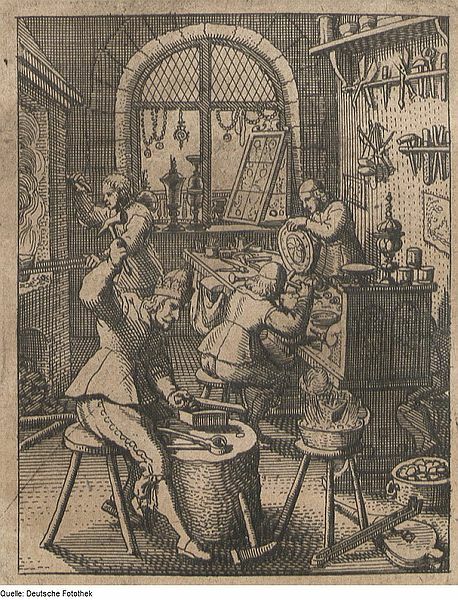 A goldsmith works primarily with gold making jewelry and other objects using techniques such as soldering, casting, polishing, and engraving. Traditionally goldsmiths also fabricated objet d’art, necessaires, flatwear, dishes, religious icons, and many other items of daily use. Most of those items are cast today or are made of lesser materials. Contemporary goldsmiths are generally versatile in fabrication techniques for all precious metals. Goldsmith in the Mid-17th Century.